After a wonderful Tibet tour, you may want to buy something for friends and families, or just leave for yourself. Then you need to think about the price and compare the things you want to buy between different stores. Normally, you can buy various kinds of Tibetan handicrafts, jewels, ornaments in Barkhor Street. 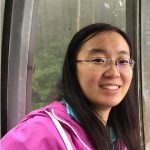 But for Tibetan medicine, you should go to official medicine factories. Here I list some kinds of Tibetan souvenirs which you can refer to. For women, it is good to buy some Tibetan ornaments. And you have a wide range of options to select. Most Tibetan ornaments have auspicious meaning and strong Tibetan Buddhism taste. Because of the lifestyle of nomads, they usually buy ornaments with rest money. And they are easy to carry to everywhere. 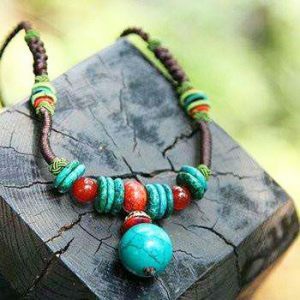 Yak bone, silver, agate, coral, shell, turquoise are the main materials for making Tibetan ornaments. And each material has different meaning. For example, turquoise means sky, water and air. Also, it is the symbol of God representing majesty and auspice. For coral, it means power and nobility. Silver is used for making bracelets and rings. Normally there are Sankrit scriptures on them which have the function of blessing for happiness and avoiding evilness. 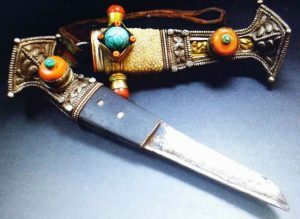 Tibetan knives are very exquisite. They are not only useful tools in Tibetans’ daily lives but also beautiful decorations for aesthetic values. So when people travel to Tibet, they always buy Tibetan knives as presents. From the perspective of scale and size, there are long knives, short knives and small knives. Long knives can be one meter long, short knives for forty centimeters and small knives only have the length of about ten centimeters. On the cover, there caved elaborate patterns, such as wild animals, flowers, plants and etc. Some even imbed jewels and gilded gold, which make the knife cover especially gorgeous and rich. Tips: You cannot bring knives to the airplane, so you had better mail them to your home country. 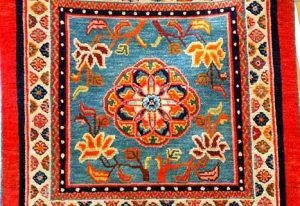 As one of three great kinds of carpets, Tibetan carpets are well-known in home and around the world. They are very beautiful and represent the ancient artistic value in Tibet. One kind of Tibetan carpets is called Kadian, which is a small rug set on top of beds or chairs. “Ka” means “above” in Tibetan language. And it can keep warm and prevent wetness.